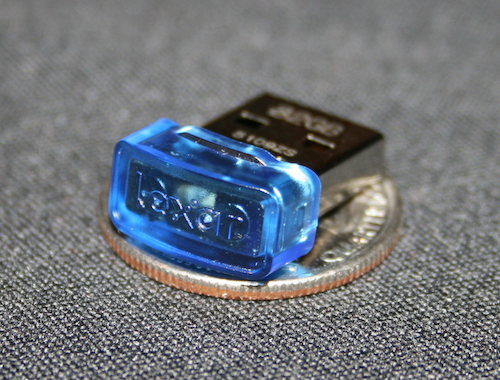 [CES 2010] Lexar's Tiny Flash Drives Provide Mobile Backup Solutions | OhGizmo! Flash drives are great, but if you’re looking for a backup solution for your notebook/netbook, they aren’t generally your first choice. After all, who wants to mess with plugging it in every time you want to do a backup, only to have to remove it again later? Lexar was showing off their new Echo ZE Keys, which are some of the smallest flash drives on the market. They’re small enough to stay plugged in at all times, which is why they might be a great option for backing up your laptop or netbook. The tiny drives measure just 20.1 by 15.1 millimeters, making them one of the smallest in the world. Of course with a capacity of up to 32GB, small isn’t always the best word to describe them. Each drive comes loaded with Lexar’s Echo backup software, with features like targeted file backup, file versioning and 128-bit encryption. Look for these next month with a price tag of around $140. It's so small! I love that I could keep it plugged in, even during transport.